"I give my blood, my life, all I have in exchange for victory." She is a fantastic representation of the Mardu color wedge. She costs WBR to cast in this deck almost 100% of the time, no matter if it's the 1st, 2nd or 3rd time we cast her. She's a threat in her own right, she gets targeted and takes the heat while our deck can do its thing. If she dies, then see #2. Have you seen her artwork? 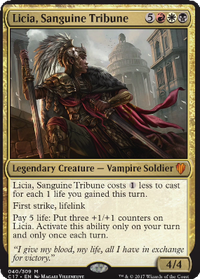 Licia is the Sanguine Tribune. She wants to spill blood and sacrifice her army, her life total and even herself. She epitomizes the recklessness of red, the price black pays for greatness and the rebirth and life in white. With that in mind we set out to do so by playing damage based effects that affect all players, we sacrifice Licia and other creatures to draw cards or give us acceleration and we pay life to further our strategy. We suffer but our opponents will suffer more. Our commander cares about gaining huge amounts of life on her turn. Gaining incremental pips of life here and there is not the plan. We're not trying to put together a Rube-Goldberg machine of triggered lifegain abilities, so your Soul's Attendant s and Cliffhaven Vampire s are not going to be making an appearance. Only an invitation has been handed out to Kambal, Consul of Allocation since he does such a damn fine job of draining the table all by himself. We're here to take risks. Go big or go home! Draw ALL the cards, gain ALL the life and deal ALL the damage. We have a few ways to reliably cast our commander on turn 3-4. Most notably Serra Ascendant and my personal favorite: Icatian Moneychanger . Other ways include Glory-Bound Initiate and Tavern Swindler , 50% of the time, it works... every time. Ivory Tower is an overperformer and allows us to gain a ton of life over a game. It combos really well with Land Tax and especially Necropotence / Ad Nauseam . There are a lot of interesting plays you can do with Children of Korlis and Tainted Sigil where you pay a ton of life and gain it back straight away. Necropotence , Treasonous Ogre , Fire Covenant , Plunge into Darkness , Ad Nauseam and Aetherflux Reservoir all take advantage of this synergy. The second ability on Vizkopa Guildmage stacks! This allows for some hilarious plays and can kill people without them knowing what hit them. Swords to Plowshares can be used as a combo piece by exiling Licia or another high power creature we control to gain enough life to finish off the game with Aetherflux Reservoir . Mirage Mirror becoming a copy of Ivory Tower , Children of Korlis / Tainted Sigil or Exquisite Blood is a sight to behold. There is a large Sunforger package that is capable of answering most threats that will be thrown our way. For the most part we really don't care about our graveyard. Exquisite Blood + Aetherflux Reservoir or Exquisite Blood + Vizkopa Guildmage . Children of Korlis / Tainted Sigil + Treasonous Ogre + Fault Line / Earthquake / Rolling Earthquake / Molten Disaster . You have to have the highest life total. Children of Korlis / Tainted Sigil + Aetherflux Reservoir allows you to take out at a minimum two players by paying 50 life and gaining it back straight away. Children of Korlis / Tainted Sigil + Vizkopa Guildmage + any card that allows us to pay life without paying for it. Why didn't you include ...? Exsanguinate and Debt to the Deathless ? Because Earthquake and Fault Line do the same thing since we break the symmetry by having so many other ways to gain life. Also they work incredibly well in the early game as board wipes to answer fast starts that our opponents might have. Boon Reflection , Rhox Faithmender and Beacon of Immortality . Frankly I haven't gotten around to trying them in the deck but my gut has been telling me they might be a bit greedy. Manabarbs -> Demonic Tutor . Never found a "perfect" time to cast Barbs in the games that I drew it. Demonic Tutor is a staple and will give the deck more flexibility with how many answers it runs. Tithe Drinker -> Tainted Sigil . Sigil is a very important piece to the deck. Both as deterrant for attacks and as a combo piece. Tithe Drinker is basically there for the extort stapled onto it and that just isn't powerful enough. Fumigate -> Rolling Earthquake . Fumigate might find it's way back into the deck but I want to try to run *more boardwipes that can come down on turn 2-4 in case of explosive starts from my opponents. It also serves as a win condition. Toxic Deluge is also a card I'd want to find a spot for. Dawn Charm -> Reverberate . Want to try out different utility. Can copy the big x-spells, can counter a counterspell and is able copy some sweet cards the opponents might be running. Damnable Pact -> Ad Nauseam . Huge powerupgrade for the deck. The deck loves to play with it's lifetotal and this digs to our multitude of combos and synergistic pieces. Oreskos Explorer -> Weathered Wayfarer . Getting ANY land trumps the explorer. The lower cmc is welcome as well. Hopefully in the future the deck will run more utility lands, ABUR duals and Ancient Tomb so the Wayfarer should only become stronger as time goes by. Pestilence -> Molten Disaster . Now Pestilence might make a comeback but probably not at the expense of Disaster. The split second on Molten Disaster makes it very appealing and gives us a great way to wipe the board or flat out win the game while our opponents think they're safe behind a Counterspell or a Teferi's Protection . Sorin, Grim Nemesis -> Sword of War and Peace . I'm truly sad to see Sorin get cut, I've had some great moments with him and he always seemed to stay on the field longer than you'd think. Before I get too emotional I'll just say that he will be fondly remembered.  Regarding Sword of W&P, it can gain us a ton of life while also giving us protection from Red and White which is relevant since most of the board wipes are red and damage based so the equipped creature will have the damage prevented. Plunge into Darkness -> Font of Agonies . Plunge has been subpar so far. I just never want to cast it when I have it in my hand. I've been loving the powerful 1 cmc spells this deck has and Font seems like a very synergistic piece. I'm excited to see it in action. Night Dealings -> Gisela, Blade of Goldnight . I've not been impressed with dealings since it's a bit low power for the deck. I really like Gisela and wanted to find a home for her. She works very well with the damage based board wipes the deck runs. Well of Lost Dreams -> Axis of Mortality . I've also not been impressed with Well of Lost Dreams. This deck has so many efficient card draw spells or huge bursts of card draw that spending this much mana for a card that needs set up is not worth it. Axis will enable some crazy shenanigans instead. Both of these additions are quite high up on the curve and might get cut at a later date when this deck continues to get streamlined. Blood is life, blood is death and blood is violence. I'll be updating this primer periodically and I'm open to criticism and card suggestions!